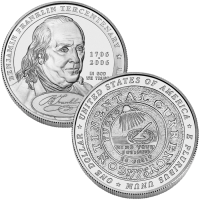 Celebrating the tercentenary (300th) anniversary of the birth of one of America’s most famous founding fathers, the United States Mint released the 2006-P Benjamin Franklin Founding Father Uncirculated Silver Dollar. Franklin is the only individual who signed four major documents relevant to the creation of the new country – the Declaration of Independence, the United States Constitution, the Treaty of Paris and the Treaty of Alliance, Amity and Commerce. Aside from his status as a statesman, Franklin was also well known as a scientist, author, inventor, soldier and diplomat. Franklin is also remembered for having created the first lending library in the country and the first fire department. A surcharge was added to the sale of each coin by the US Mint with the raised funds being forwarded to the Franklin Institute for purposes of the Benjamin Franklin Tercentenary Commission. The US Mint released the Uncirculated Franklin Founding Father Coin on the 300th anniversary of his birth – January 17, 2006. The initial price charged for the Franklin Founding Father Uncirculated Coin was $33.00. 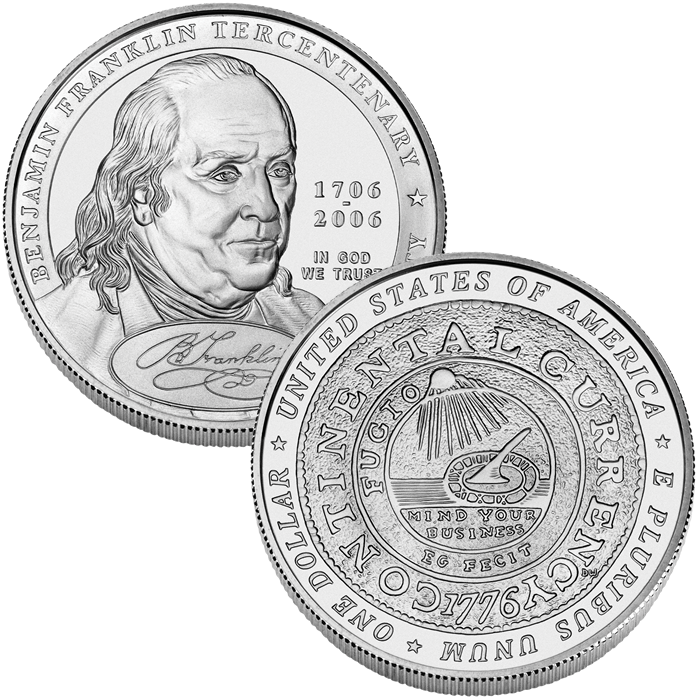 Designed by Don Everhart, a portrait of Benjamin Franklin along with a reproduction of his signature are found on the obverse (heads side) of the coin. The reverse (tails side) was designed by Donna Weaver and features a reproduction of the 1776 Continental Dollar with modern lettering around the rim.